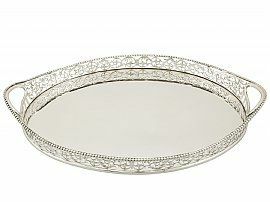 This exceptional antique Edwardian sterling silver drinks tray has a rounded navette shaped form. The hallmarked base of the tray is plain and unembellished. The galleried border is embellished with pierced scrolling leaf ornamentation accented with quatrefoil floral motifs. The upper rim of the hallmarked galleried border is ornamented with a band of applied bead decoration. 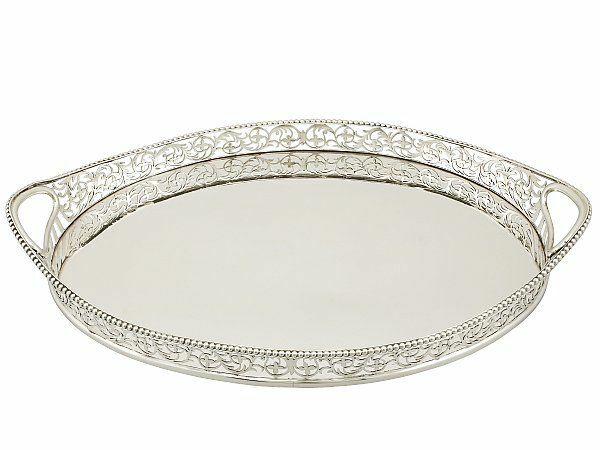 This impressive sterling silver drinks tray incorporates a plain oval shaped inset handle to either end, accented with a panel of pierced pale decoration to the nadir. This galleried drinks tray was crafted by the renowned and collectable London silversmith Charles Stuart Harris. This antique drinks tray is an exceptional gauge of silver, exceptional quality and in exceptional condition. Full hallmarks struck to the surface of the rim and part hallmarks to the underside of this silver drinks tray are all very clear; hallmarks are deeply struck and sharp due to the exceptional gauge of silver. Height to top of handle 4.6cm/1.8"